I am part of a group of artists who get together regularly to exchange Artist Trading Cards. The students were intrigued by this and asked if they could make some too to trade. So we did! 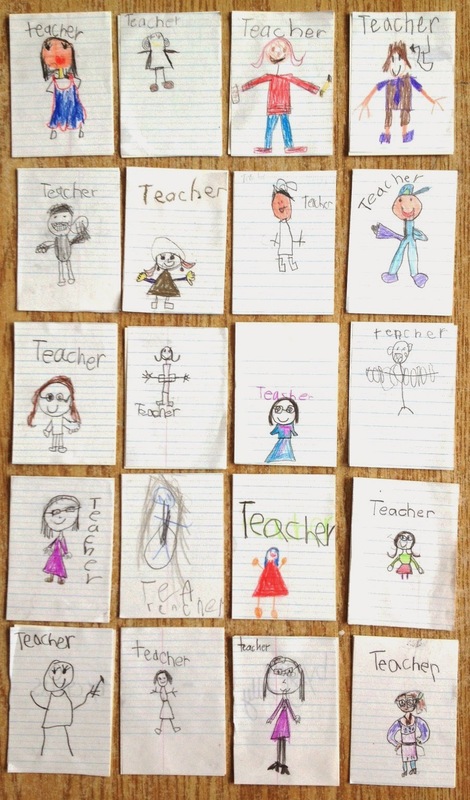 ATCs are the same size as sports trading cards - 2 1/2 inches by 3 1/2 inches.I gave them each a piece of lined paper (our theme was "School Days") and asked them to draw a teacher. They had to decide what a teacher looked like. Funny, many of them wear glasses.... and were wearing the same thing that I was wearing that day. But I asked them to close their eyes and visualize what a teacher looks like (we close our eyes and visualize fairly often). This is what the class came up with! We will do more trading cards in the future. We are hoping to trade some with some other classes in Toronto!